Thanks to your growing support, Tamiyablog reached its first 100.000 visits earlier than we would have dreamed of when we started this blog 18 months ago. 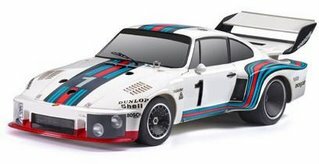 For the celebration post we have chosen the Tamiya Black Porsche 934, as it was released to commemorate 100.000 sold 58001 Porsche 934 RC kits in Japan during 1976-1977. We would like to thank you for your continuous support and hope we will be able to present to you also in the future many news and interesting articles related to our favorite company, Tamiya. This entry was posted in Event Report on February 27, 2008 by admin. It seems that Tamiya is introducing with the 58405 Toyota Land Cruiser a return to their classic box art which inspired a whole generation of kids and modelers, will be interesting if they will keep it in the future for their “old-school” models and if touring cars will continue with their “modern” box art. This entry was posted in Future Releases on February 15, 2008 by admin. This entry was posted in Event Report on February 8, 2008 by admin. Modified motor “third wave” had come in 1993 or later. Before that, from the late 1980s through the early 1990s “boom F1” Were not, but here is used solely SUTOKKUMOTA 540 type. 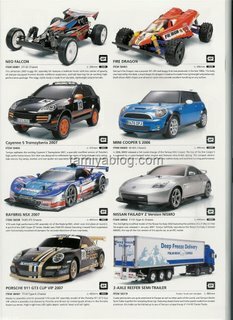 “ROAD WIZZARD” to “F101 chassis” with the development of F1 GP Tamiya popular categories and classes and the beginning of the EXP unlimited weight class is, as it was nearer 930 to 950 g What ridiculously lightweight machines also being tailored, modified motor once the “fifth wheel”. Even DYNA-TECH 01 R, Power HAARI spare as he feels, is hard to master. 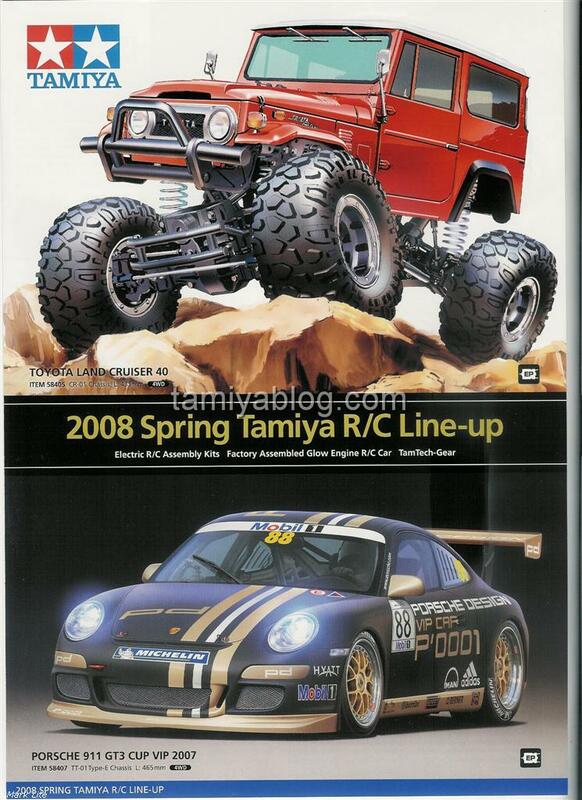 Later, Tamiya Japan starting from now when all classes are now more than 1000 g, in any case focusing on performance improvement, and the main shaft and chassis parts to replace carbon materials, or cutting, such as “lightweight “. Battery performance is improving year by year it began, the Power 540 “sports EXP also driving satisfaction” was possible. The per the RC kit now lost part of me. “Lightweight, simple, fast enough 540 kit” and want to be resurrected. . . However, the loop is also F1 boom, and then boom in the touring car, the weight IKANSEN 1600 g (then revised in 1995 to circa 1500 it became the provisions g) burden, and provides complete power shortage of 540. In order to obtain satisfactory performance review modified motor. Battery capacity also increased from 1400 to 1700 also reduced the frustration runtime. The flow from that first came out, “ACTO-POWER” series. 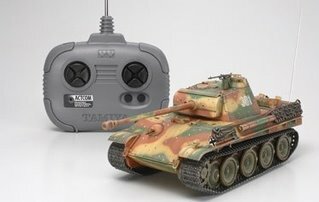 The motor, and finally Tamiya, even as a general-purpose brush thoroughly entrenched in the general “5 × 4mm brush” has been adopted. Ave! 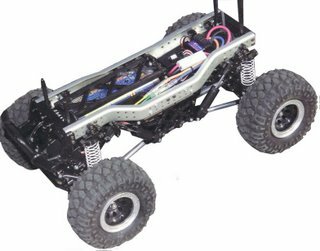 2 WD ACTO-POWER First came out of the race for two open buggy WD “DYNASTORM” has been developed to take the double-pink cans 0.75mm14T “WD ACTO-POWER OFURODA 2” (op.122, 4800 yen, 92 Nov). 0.70 mm15T double followed by “touring ACTO-POWER” (black cans, op.153, 4800 yen, November 1993), 0.70 Double mm17T “ACTO-POWER Formula” (op.154, 4800 yen, 93 Nov) appeared. And this time, the battery is also revamping the capacity up “SCR 1700” (Item55056, 5,200 yen, released in October 1992), was later “ultimate” enshrined “SCRC 1700” (Item55062, 5,800 yen, 1995 March release) appeared. SCRC is particularly 1700, 1800 and the actual discharge capacity 1900mAh and ensure the discharge characteristics of excellent goods unparalleled in the past. Actually this “SCRC” cell type, cell battery sanyo industrial catalog is the first “RC exclusive goods.” In particular, the first year of production, the so-called “Z Damas” extraordinarily good performance, after years of treatment with a lot of this is zapping performance from the “difference in battery performance by different lot”. “ACTO-POWER” series is the “line-up purposes, according to a prepared”, in other words “to deal with diverse needs,” the point. Already “TEKUNI” series in the rotor to ensure compatibility, “DYNA-TECH” opt-series set in the form of the rotor was not groundbreaking, but “ACTO-POWER” one step farther, separately from the package NARIMASHI hoop. That market has been growing that? Come to think of it, these days, the kit will be released in the number of variations of the body in the form of increased rapidly increased. Overseas exports also grew. 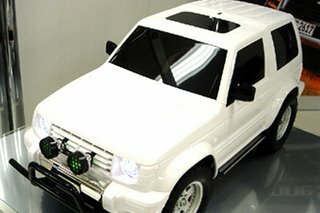 However, in ACTO-POWER, in the form of limited production spot by selling “TRF ACTO-POWER tune” (Item49567, 8000 yen, released in December 1993). Ostensibly for buggy, but in the first place, leading to the 1992 is being developed around a prototype buggy “TRF411X” according to the TRF’s activities Works made goods. Double-rotor winding is 0.8 mm and 12 T H 02 DYNA-TECH high spec since. 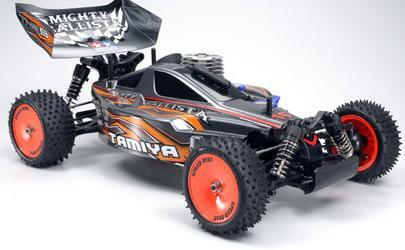 Magnet also strengthened by the opt-10 H 02 DYNA-TECH rotor specification is not the enemy, but as a normal state of TAMIYA MOTOR power highest level in history. TRF is a brush 411X Cheung said at the time boomlet, 5 × 5mm, the so-called Big & big commutator combination brush. Bell is also in the luxury end, cutting out the aluminum. Big commutator, ig brush, cutting aluminum at the end of Bell’s first model is adopted. Kang also encourage special cooling fin processing Special items were seen. While the price of 8,000 yen SURPRISE! Choicest hand-rolled motor 5000 6000 era might have bought the yen,! Rotor winding machine! Works of the bubble economy period just bear close resemblance to the motor design, but also anachronistic is downright disappointing. Collapse of the bubble economy, as long Buggy boom only mania, TRF prior to the release of motor buggy race fields were extinct, and even buggy Tamiya GP New Year’s race is only the beginning of the year already do not pay any more and who is gonna use this? 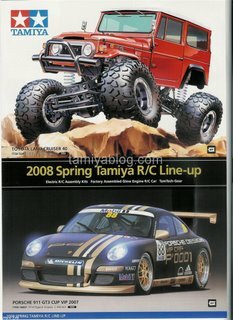 Ultimately, the only Tamiya GP class also uses Gr.A was abolished in 1995, and to further open up cross race in the Big brush use is prohibited, age 95 is the big brush one sitting out. Tamiya eventually brush is a staple in the replacement of items that are not disclosed. So, really useless and motor BABURI become is also disappointing. 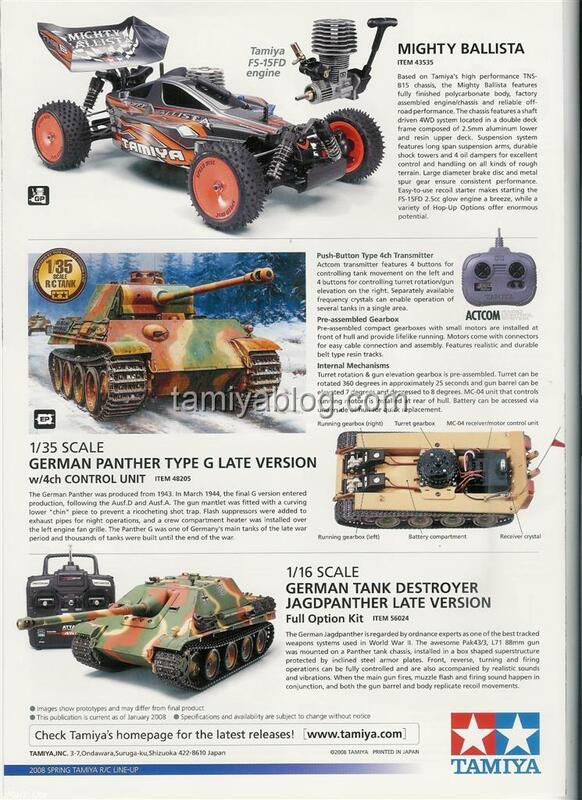 In the past TAMIYA MOTOR was not planning products? That, too, even after this funk without getting new products out. 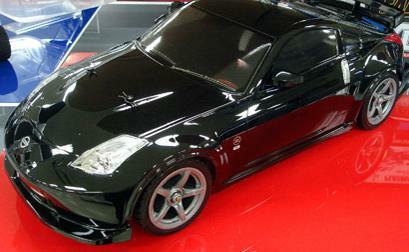 At the end of 1995, the newly-built SHINNAGOYA, “Special ACTO-TUNED motor M” and “DYNA-RUN” series begins. “Special ACTO-TUNED motor M” commonly known “M tune” (op.251, 3,000 yen, released in December 1995) is a small lightweight chassis MINI COOPER for M, keeping in mind the length of normal rotor type 540 1 / 3 truncated, motors and overall length almost half of the 540 types of special motor. 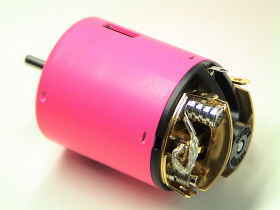 Normal motor and the motor is not a simple comparison, the rotor is certainly a single 0.65 mm T-22 was winding remember. 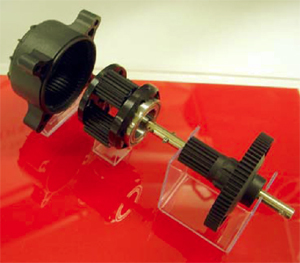 The motor was decomposable, bearing oilless to reduce the cost of the combination is rare. “M Tuned – on” is a small, lightweight, thin torque motor minutes and will be easy to property, changes to be able to advance, reverse motor used in the M-02 chassis to be used, such as point Woori. 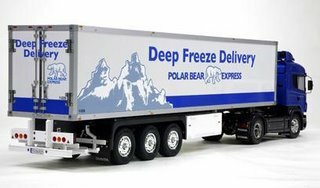 The aim is as much for the goods but was, however, the heat capacity is smaller in size commensurate Know in the end completely motor can opening bell and cooling performance is not zero, then immediately travel to heat happen, motor nuisance. But Tamiya GP season is about 2 to M-Class chassis and EXP are banned, M Tuned also unavailable. 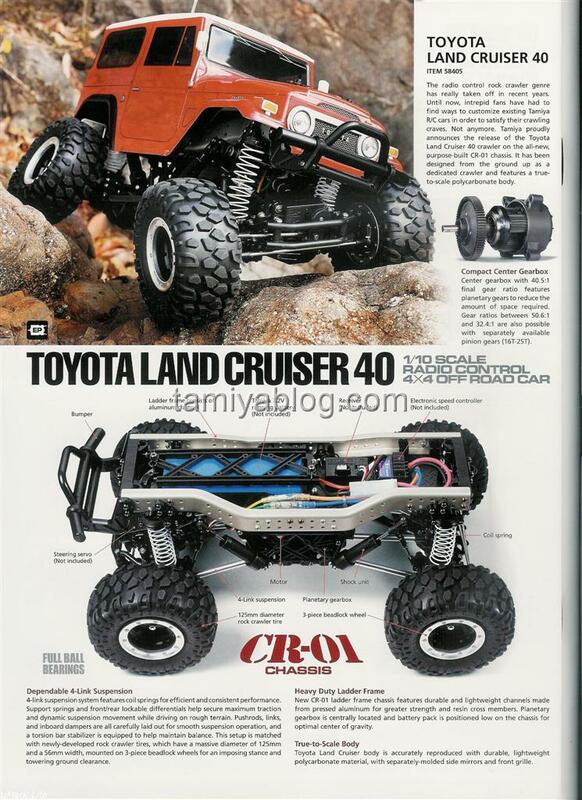 Until the 2002 model was left catalog, but now, people who are M chassis, I have almost forgotten? 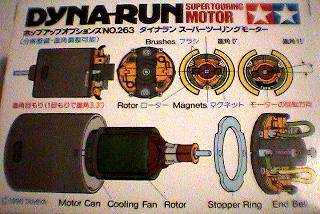 Meanwhile, the touring car for “DYNA-RUN” series at the time, efforts have been 1 / 12 on road awareness and advocate strongly for it was “short stack” of the specifications of the rotor, which features were adopted . This is the rotor to fill the full length of the light, so that the rotor torque also weak finish by a strong magnet motor to be easy to finish rolling, to improve throttle response, the aim experience. Lineup of the modified “super touring DYNA-RUN” (short stack single T = 15) (op.263 substantially equivalent 13-turn, 5,000 yen, and released in June 1996) and the type of stock “DYNA-RUN stock” (short stack Single real 20T = 17) (equivalent to turn op.272, 2,500 yen, released in October 1996) has been put in two types. Both are basically bell-end “M tune” common, Couling bad omissions, the brush is dry and easy to change design, “ACTO-POWER” bell-end precision machining is worse than it is regrettable. Frankly, the less popular Very poorly. Others have no choice but to reluctantly use anybody. DYNA-RUN system, the rotor length is shorter minutes by filling an empty space cooling fans, and the forced-cooling device is also equipped with the feature. 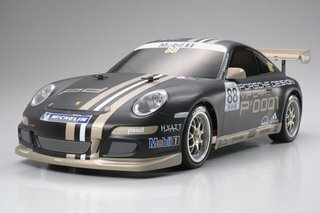 The concept itself is cooling fan, Johnson has already made TAMIYA MOTOR as “H DYNA-TECH 02”, but there is a proven recruitment. But fans DYNA-RUN system, shape issues and the lack of attention to air flow, such as the cooling performance is not necessarily expected to have had lamented that point. After all, Bell and end the “hole” is almost not open. Other side of the hole is open, the Air “exit” is not in the “entrance” is not quite so end up in the air in a motor only. Not just mean more losses, is it? Why is that kind of nonsense design, is still a mystery. In the performance, “stock” and “super touring”, as the aim indicate, in response to the throttle work smoothly handling Sato Yasu well-balanced power to the finish, and to adopt a new brush (also sold separately as Racing motor brush op.307 by Mark M, T Mark after the former stamping modified brush) coupled with high performance and good performance. Consequently, but Tamiya GP touring as a spindle motor for the summer of 2001 “T Super Stock 23” series will come to a fairly long-term use. 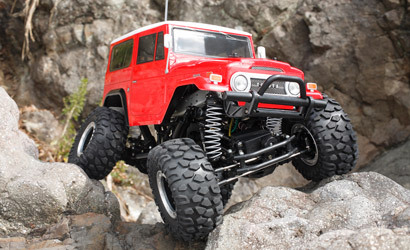 Another series of these particularly notable in the motor system, “BURASHIDANPA” TAMIYA MOTOR introduced as the first point. BURASHIDANPA is the leading Japanese motor tuner, as invite eminent emerging as a manufacturer of motor activity started from age 93 nagoya Singh was introduced ahead of competitors, the company’s motor “Uri” and it was one of mechanisms. “Damper” says the so-called shock absorber to the recall should not. Bottom spring-loaded brush from the brush with a brush holder coercive force, to reduce the commutator with butter and stabilize contact with the brush holder and improve adhesion of the conduction efficiency of the device. As photos of the brush holder of a thin stainless steel sheet to the bottom of the peg, which cleaved into a little function as a spring board to wake up let them. The idea is simple, but can not dumb. – The performance was more favorable because it is obvious, since the micro Sagami OEM supply will be from 5 × 4mm motor brush with a “natural” equipment has become today. This entry was posted in Reviews, Vintage on February 4, 2008 by admin.